Whole Schooling renewal relies heavily on what is most powerful in helping improve schools -- the development of Professional Learning Communities in which staff dialogue about their vision, concerns, and strategies for improving student learning and discuss needed school-wide programs, structures and supports. The aim is to support dialogue and engagement that empowers teachers, parents, and students. Mike Schmoker in a recent article in Phi Delta Kappan clearly articulates the need for such teacher- and parent-empowered approaches to improving schooling and teaching. Below, we discuss strategies and approaches that may be useful in focussing engagement of the school learning community. Central to planning for school renewal using the Six Principles of Whole Schooling is the agreement of the staff that the Six Principles provide a valuable and needed set of goals towards which the school should move. If this is true, then all involved with the school - teachers and other staff, parents, and students - may consider the degree to which the school as a whole, as well as individual classrooms, are based on the 8 Principles of Whole Schooling. Teams may then develop strategies for improvement. Following are examples of key questions that will be addressed with action plans. Space for all. How can we use the physical resources of the school and classroom to best respond to the learning style and needs of students? How can we use space to encourage authentic learning, interaction in a learning community, providing time and place to be alone as well as working in small groups? How can we use technology, including a wide range of assistive technology to assist students in their learning? Empower for democracy. To what degree are multiple constituencies involved in making significant school decisions? How are students involved? Do students have multiple opportunities for daily decision-making, choices in their studies, opportunities to use power, involvement in resolution of conflicts? Include all. Who is in the school? Who is not? Where are students who would typically come to this school? How might the school connect its students to other students with diverse characteristics (important for schools without racial or ethnic diversity)? Build community. Does a sense of community pervade the school at all levels – staff, parents, children? What specific strategies are used? How might the school strengthen community through concrete, specific strategies? Is there a commitment to children with social-emotional challenges and problems? Is positive behavioral support integrated into schooling and classroom practice? How might the school strengthen community and ways to proactively meet the social and emotional needs of children? Support learning. Are support staff being used to support students in the general education class? Do they work as a support team for the entire school addressing academic, technology, social-emotional, medical, and other needs of students? Do they work with teachers to improve authentic, multi-level instruction, building community, and using positive behavioral supports in the classroom? Partner with families and the community. To what degree do parents feel a partnership with parents, particularly parents of students with high challenges – those with disabilities and highly able students? To what degree are the resources, gifts, and talents of parents and the local community used to strengthen learning? How might the school break down the barriers between school staff, parents, and community? Teach all using authentic multi-level instruction. To what degree are instructional strategies used in the school to help students with very differing ability levels learn well together? Are there teachers who are using exemplary strategies? How might they assist other teachers in the school? What assistance does the school staff need in learning how to do multi-level instruction? Assess to support learning. How can teachers and other educators assess student learning in a meaningful way? How can we focus on a holistic view of the student, looking at authentic academic achievement, development of social and emotional capacity, identifying key student strengths? How can we use assessment to understand better how a student learns and how we might best teach this student? Brief written documents and Powerpoint presentations are available that provide an overview of the need for Whole Schooling and the Six Principles of Whole Schooling. We have found it useful to provide an overview for staff and then to divide the school staff into six groups, one for each principle. Each group is asked to use the open-ended questionnaire - Whole Schooling: Strengths and Needs of Your Class and School - to identify strengths, needs, and possible strategies for improvement related to the principle to which they are assigned. Each individual brainstorms on the form and the group records it’s answers on chart paper. All groups then report back to one another, sharing their results and asking for additional input from the rest of the staff. The group then reports back. This information can be typed and recorded and can often become a key starting point for an action plan for school improvement. A particularly powerful tool for use with a staff is to engage the staff in developing a vision for the type of school they would like to be and an action plan to move in that direction. Two tools developed have been found particularly useful: (1) MAPS (Making Action Plans) and PATH (Planning Alternate Tomorrows with Hope) (Falvey, Forest, Pearpoint & Rosenberg, 1998). These tools are often most helpful after staff have been introduced to the Six Principles of Whole Schooling as these principles provide stimulus for an expanded view of schooling and teaching. Both MAPS and PATH provide tools by which a group of individuals may develop a vision or dream, consider present barriers, identify strengths and resources, and develop an action plan by which to move forward. MAPS and PATH are powerful, collaborative planning processes by which to bring together a staff around a common vision and goal, bonding as challenges, history, and strengths are shared. When a school adopts the Six Principles of Whole Schooling this can provide a powerful, ongoing school-wide focus to drive the creation of a renewed learning environment. Schools use differing procedures for school-wide adoption of programs, projects, or initiatives. At best, staff develop a consensus that the Principles of Whole Schooling reflect the type of school they would like to become, consensus being defined, not as total agreement, but a willingness of all to work together rather than derailing efforts at change. The most informal level by which the Six Principles of Whole Schooling may be used involves providing resources and tools to allow teachers and administrators to develop and implement individual goals and strategies. Some administrators, for example, have used the descriptive materials on Whole Schooling and tools such as the Whole Schooling Self-Assessment and Action Planning Guide to reflect on their school and consider ways to develop committees, study groups, or other strategies to address needs. They might do so without involving others in using these tools or even sharing the influence of Whole Schooling ideas with staff. Similarly, a teacher might use a tool to engage in reflection on his or her own classroom. Whole Schooling Strengths and Needs. This tool involves an open-ended questionnaire organized by the Six Principles of Whole Schooling. It asks individuals to make narrative comments regarding strengths and needs related to school-wide and individual classroom practice related to each principle. Individuals may also provide ideas for change or improvement strategies. When these are completed, the narrative comments can be compiled and organized by each principal for school-wide issues and individual classrooms, clustered by teams, for example, third grade teachers, or the science department in a high school. Quality Teaching for ALL: Self-Assessment Rating Scale. This tool is organized by the Principles of Whole Schooling. A variety of items intended to reflect exemplary practice are listed for each principle and the respondent rates the school or individual classroom using a 5 point Likert scale. Using information for analysis and action planning. Information that is compiled for the school can be distributed to the entire school staff and used in a variety of ways. The school improvement team may look at this data and use it as the basis for a strategic action plan. Similarly, school teams may utilize the information to understand strengths, areas of need, and develop strategies for improvement. All learning and growth, including the improvement of schools and teaching, is centered in building on strengths. Sometimes educators feel beleaguered and without support and assistance. However, any school possesses a wealth of resources. This simple open-ended tool is designed to capture capacities and assets of the total staff and parents in the school. The tool asks individuals to list and briefly describe assets they have related to each of the Six Principles of Whole Schooling which they would be willing to share with others. Such assets may include abilities and skills, resources to which they have access, or materials and tools which they can use. This information is then compiled and put into a Resource Directory for the School. It can become a tool for person-to-person connections, a source of resources for staff development, and a way of building increased appreciation among all involved. As the school identifies areas of need, study / action teams may be developed. These might be organized based on the Six Principles of Whole Schooling or sub-divisions of these principles. For example, a school might be particularly concerned with both math and literacy instruction. They may organize a team designed to help improve “authentic, multi-level instruction” in each of these areas. The school should carefully consider, however, developing working groups that address the social-emotional foundations for learning – including all, building community (along with positive behavioral supports), supporting learning, and partnering with families and the community. This is particularly important since these areas often receive too little attention. Study / action teams may collect data related to the issue they are investigating, read materials together, discuss implications for practice, go to a conference or school site visits together, identify new strategies to try with students, and engage in reflective dialogue about daily practice, all aimed at creating positive change. Students themselves can be involved in helping to make the school and classroom a better and more effective place. As teachers and parents use practices associated with the Six Principles of Whole Schooling, students will be learning much. However, students can also be involved in explicit ways. Middle and high school teachers may ask students and parents to complete one of the school-wide self-assessment tools. For elementary children, staff may want to take these ideas and put them in simpler text and use pictures as well. Teachers might hold focus groups with children in their classes, or perhaps teachers conducting such discussions in each others classes. This could be a particularly powerful way for a grade level team in an elementary school or interdisciplinary team or 'house' in a middle or high school to obtain powerful information from students. Focus groups could also be held with parents using one of the Tools as a focal point of dialogue. 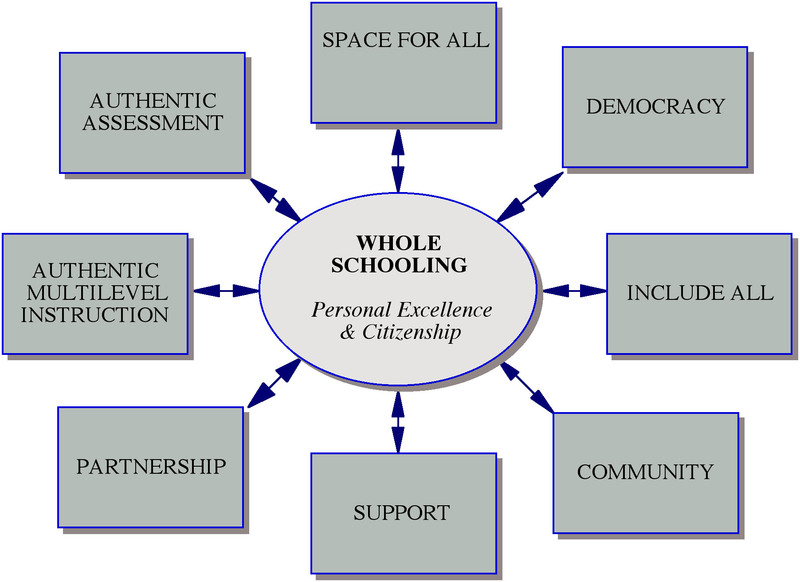 The Six Principles of Whole Schooling, in association with strengths and needs assessments described above, may also be used as a template for developing local professional development opportunities and identifying conferences and other external professional development events available in a local area. Whole Schooling Teacher Self-assessment tool is particularly useful for this purpose. The Quality Teaching for ALL: Self-Assessment Rating Scale. tool is designed to assist individual staff in conducting a self-assessment of their own strengths and needs related to the Six Principles of Whole Schooling. This information can be used to set individual professional development goals and seek professional development opportunities to increase skills and capacities in areas of need. Many approaches to school reform rely heavily on a relationship between a school and a knowledgeable, trusted individual who can bring new questions, ideas, resources, and strategies to a school from the outside. Often such individuals are university faculty or staff of intermediate school support organizations supported either through grants or consulting relationships with the school. Critical friends can assist and be involved in any of the processes described above. Critical friends should spend time in classrooms, getting to know teachers, the principal, parents, and students so they have a sense of the culture of the school and it’s strengths and needs. Critical friends can facilitate important dialogue both within formal gatherings as well as informal interactions. A very powerful tool for learning and growth are opportunities for educators to visit different schools and classrooms that exemplify positive practices related to the Six Principles of Whole Schooling. Teachers can visit the classrooms of other teachers, observing and discussing strategies with the host teacher. If schools have conducted a Capacity and Assets Analysis, this information can be used with other schools to identify strengths which can be shared across schools and school districts. The following materials and tools are available for use in your school. All may be downloaded. 4. Whole Schooling Self-Assessment Rating Scale. 5. Quality Teaching for ALL: Self-Assessment Rating Scale. 6. Six Principles of Whole Schooling. One page description of the Six Principles of Whole Schooling. Useful as a summary handout for school staff and parents. 7. Whole Schooling Website: www.wholeschooling.net This website provides a wide range of resources including an overview of Whole Schooling, publications, links for resources related to each principle, video clips that illustrate classroom practices, and information regarding related projects and initiatives. 8. Whole Schooling Listserv. Educators and parents throughout the world have joined this listserv to engage in dialogue related to issues associated with Whole Schooling principles and practices. 9. Powerpoint Presentations. The following presentation provides an introduction to the Six Principles of Whole Schooling: Whole Schooling - An Introduction. This presentation discusses ways to link the use of the 6 Principles of Whole Schooling with school improvement processes as required by states, NCA, and as part of implementation of Professional Learning Communities: School Improvement for ALL. Numerous learning activities that involves teams and small groups working together have been developed for each of the eight principles of Whole Schooling. Click on the link below to access these activities. These are organized by the 13 chapters of the book, Inclusive Teaching: The Journey Towards Effective Schools for All Learners. Written by Michael Peterson and Mishael Hittie, this book is based on the concepts and strategies of Whole Schooling. We provide the links to the learning and professional development activities for each chapter below. Here's the home page for the website for the book.